A laundry room is the workhorse of a house, but often it is the most neglected. Laundry rooms often serve several purposes, including a storage area for seasonal clothes, a mud room and a pet care area. 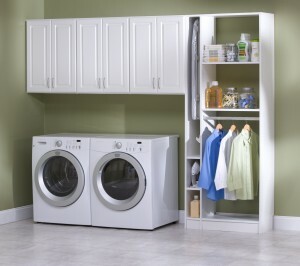 So what does it take to create a laundry room that serves its purpose but still looks good? Here is a guide to common features that make laundry day less of a chore for everyone involved. Often, dirty laundry gets piled on the floor until it gets washed. Not only is this an eyesore, but it can become an obvious tripping hazard as well. To prevent this, you can designate hampers for different types of dirty clothes, such as whites, darks and hand-wash. Household members can then deposit pre-sorted piles of dirty clothes, and clothes that are not in the hampers do not get washed at all. Hampers utilized for separate sorts of dirty clothing will not only keep the floor spotless, but will also make washing much easier because everything is already sorted. A clean countertop next to, or on top of, a dryer can become an efficient folding station. Folding clothes as soon as they come out of the dryer cuts down on ironing, makes them easier to transport and prevents wrinkling. The counter should be at waist height, which will prevent you from bending over and hurting your back. A sound system or television can break the monotony and keep you entertained while you are working. Shelving storage areas at eye level over the washing machine are the ideal place to store stain removers, laundry detergent, fabric softener and other laundry products. This will keep chemicals out of the reach of small children, keeps laundry tools from cluttering up your folding counter and allows you to have easy access to what you need when washing clothes. A rod is perfect for storing extra hangers, plus it is the natural place to hang items as soon as they come out of the dryer. For more delicate items, such as sweaters, you can use a drying rack or drying mesh to avoid stretching and your clothes getting marks on them from hangers. After you have set up your laundry space, consider what other items might be stored in the laundry room. For example, you can set up a storage area for scarves, gloves, heavy coats and other winter items of clothing. You can also designate an area for pet items, such as leashes, grooming items and small toys. If your laundry room is cluttered or if you need more room to work, Boston Closet Company can design a personalized space that will prove a joy for you to use. From the smallest spaces to large open areas like basements, we can create a functional space with custom storage solutions for the whole family. Contact us today for a free consultation with one of our skilled and experienced designers.